Although September often seems like a time of endings in terms of summer heat and the growing season, last month felt much more like a time of beginnings for healing and renewal. 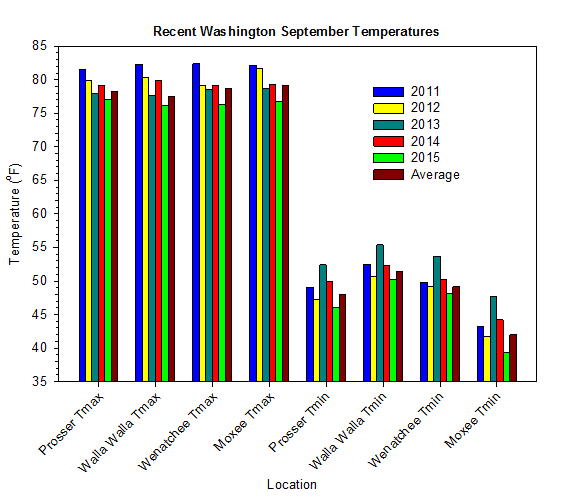 Following a long, parched summer, many locations received their first rainfall and first stretch of cool weather since the spring, as Washington inched closer to the start of the cold season. Mercifully, September 2015 was Prosser's coolest since 2005, and also the state's first cooler than normal month since last November. While last month represented the most significant positive step relative to drought and heat relief in a long while, there is still much work to be done. Below normal daytime temperatures were observed for much of early to mid to September, with a brief hot spell around the 12th separating two cool and unsettled periods of occasional rain and wind. 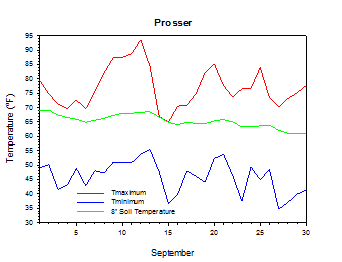 The latter part of the month was generally calmer and warmer, especially relative to normal, although a few cold nights occurred near the end of September. In early September, Mt. Vernon recorded rainfall on 8 consecutive days (August 28th to September 4th) for the first time since early February. September 5th was a notable day for Pullman, as the largest daily rain total (0.66 inches) since February 9th was recorded. The rain-chilled high temperature of only 54 degrees was their coolest since May 13th. 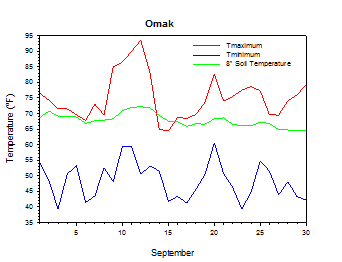 However, heat returned a week later, as Omak soared to 94 degrees on the 12th. Still, many areas saw a rapid temperature decline thereafter. 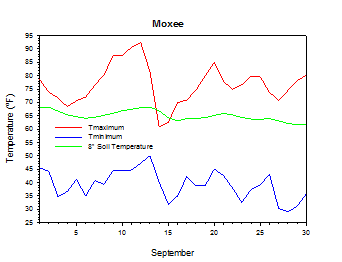 From the 12th to the 14th, Moxee's high temperature decreased by 31 degrees (from 92 to 61 degrees) in only two days, before a frost occurred on the morning of the 15th. 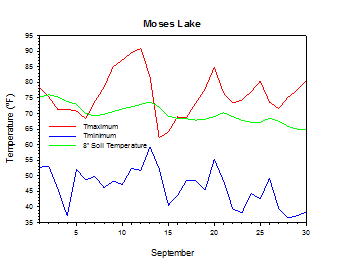 In other words, Moxee shifted from 90s to frosty conditions in about 60 hours. Similarly, Vancouver's highs fell from the 90s to the 50s in just three days from the 11th to the 14th. 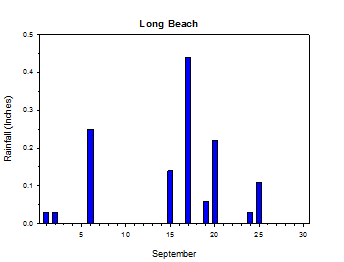 Warmer and drier days generally resumed during the latter part of September. However, a few clear and calm nights were very cold at month's end. 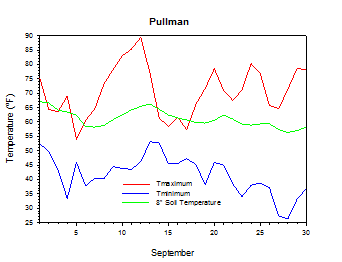 On September 28th, Pullman fell to 26 degrees. The last time that station was colder than 26 degrees was March 4th. 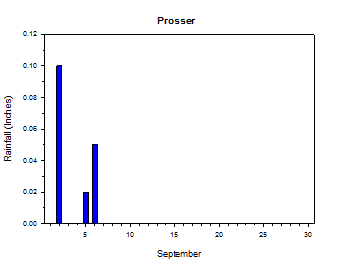 Overall, Prosser's September mean high temperature was a modest 1.3 degrees below normal. Even so, this was their largest cool departure from normal for a monthly high since February 2014, which is yet another testament to the unusual lack of prolonged cool periods during the last year and a half. The beginning of the month was cool and unsettled, as Walla Walla recorded 0.84 inches of rain on the 5th, which was their largest daily total since May 13th. Moxee dropped to below 35 degrees on the morning of September 3rd, which was their coldest reading since May 9th. 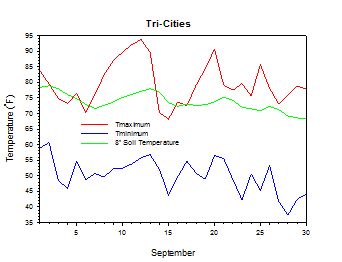 Summer's last gasp was observed on September 12th, as the Tri-Cities climbed to 94 degrees. However, rapid cooling followed for the mid-month time period, as daytime highs at numerous locations fell from the 90s to the 60s in a couple of days. Later in the period, Pullman recorded a 32 mph wind gust on the 20th. Highs were in the 70s for many areas for much of late September, as generally sunnier and calmer weather returned. However, the state experienced several cold nights near the end of the month. The low temperature at Moxee dipped to 29 degrees on the 28th. 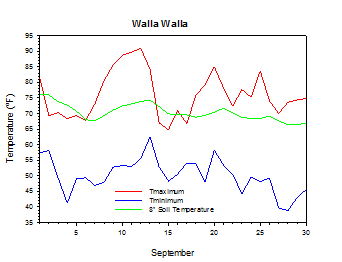 The average September temperature at Prosser (WSU IAREC) was 60.9°F, which is 1.6 degrees below average. The average high temperature was 77.0°F, which is 1.3 degrees below average. The average low temperature was 46.0°F, which is 1.9 degrees below average. The maximum temperature recorded last month was 93.6°F on September 12th, while the coolest daily high was 64.9°F on September 15th. 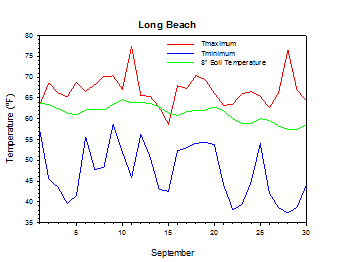 Low temperatures ranged from 55.4°F on September 13th to 34.7°F on September 27th. Daily average temperatures ranged from 72.0°F on the 12th to 51.9°F on the 27th. The monthly precipitation total was 0.17 inches. The average wind speed was 3.9 mph, and the average 8 inch soil temperature was 65.3°F. 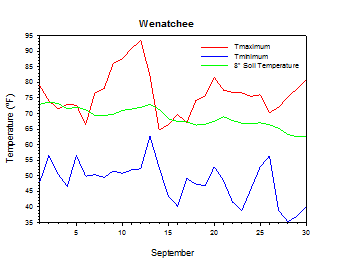 Wenatchee (WSU TFREC) recorded an average temperature of 61.9°F, which is 1.3 degrees below average, while Walla Walla's average monthly temperature of 62.4°F was 1.6 degrees below average. 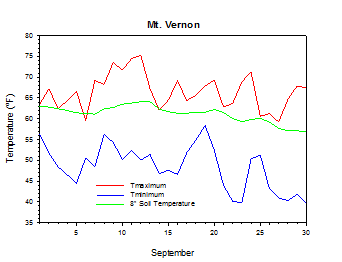 Pullman was one of the cooler spots in eastern Washington, with an average September temperature of 56.1°F. In western Washington, Mt. Vernon's average temperature was 57.2°F, which is 0.9 degrees below average. September 3th: The temperature at Moxee fell to 35 degrees. September 5th: 0.66 inches of rain fell at Pullman. September 5th: The high temperature at Pullman was just 54 degrees. September 12th: The temperature at the Tri-Cities climbed to 94 degrees. September 28th: The temperature at Pullman plunged to 26 degrees. As of early September, some areas had to re-seed winter wheat due to crusting conditions, and ripe pumpkins were ready in some fields. In mid-September, corn and potato harvest continued, and dry corn harvest began two weeks early in some areas. As of late September, apple harvest was underway in Snohomish County. The winter wheat crop was suffering due to low soil moisture at seeding, although soil moisture improved in parts of western Washington. Otherwise, hop harvest was in full swing, along with peaches and onions (National Agricultural Statistics Service). On September 18th, 2010, the high temperature at Moxee was only 58 degrees. According to the Climate Prediction Center, above normal temperatures and near normal precipitation are likely for October, and then above normal temperatures and below normal precipitation are favored for later in the autumn and well into 2016. El Niño continues to strengthen, and is expected to peak at near record values during the early winter.